When the Homewood-Flossmoor High School Vikings “three-peated” by winning their high school division at the Special Olympics Illinois State Basketball Tournament in March, they secured a spot in the record books at their school. On May 21, they received another sort of recognition that was also a first for the school district – all 11 members of the Special Olympics team and its three coaches were presented with State Championship rings before the last school board meeting of the year. Seven team volunteers also received pendants. Each student was individually called forward by their name and jersey number and presented with their ring. Afterwards, the school board held a reception complete with cupcakes. “The school board was very enthusiastic for our players,” said David Dore, Homewood-Flossmoor Special Education teacher and Special Olympics coach. 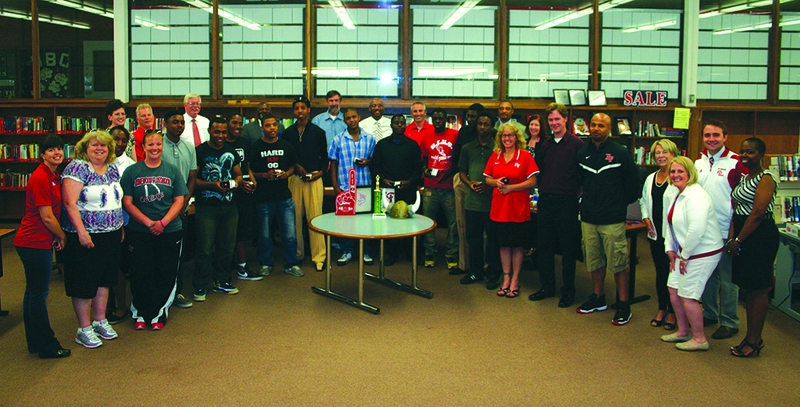 The 2013 Vikings team was comprised of Quewone Berry of Homewood; Christopher Brown of Hazel Crest; Thomas Clemon of Glenwood; Jalen Fair of Homewood; Luis Garcia of Homewood; Clarence Hatter of Flossmoor; Michael Jones of Hazel Crest; Ishmael Lewis of Homewood; Joshua Lipsey of Homewood; Terrell Marks of Flossmoor and Jamal Wade of Flossmoor. “It made me so happy that our Director of Special Education Kathy Dreger decided to do this for us,” said Dore. “This was definitely a special moment for the team.” In previous years, the team was recognized with banners hung in the gym. “This is a team that hasn’t sought out any publicity for their accomplishments and it only seemed right for them to get the State Championship rings after the three-peat,” said Dore. The team, comprised mainly of the same core players, won gold medals at State Basketball in 2011, 2012 and 2013.